The historic peninsula of Istanbul encompassing abundant picturesque and antique splendors is a marvelously inimitable city that has been a hub to countless civilizations from the old centuries and continuing in the present time. This deep-seated city, having a history that traces back to 300 thousand years before, creates a collage of many nations and civilizations. One may encounter thousands of years old heritages and shrines about every rim in Istanbul. Each passing minute there will let you capture diverse ancient and natural marvels. You will get picked up from the hotel and through these 8 hours you will get to uncover the big four – Blue Mosque, Hagia Sofhia, Topkapi Palace and Grand Bazaar – leaving you with sufficient time to discover several other sights like the Hippodrome and Rustam Pasha Mosque. 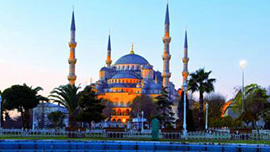 Let’s find out how these wonders stand to dazzle you in the spellbinding city of Istanbul. The majestic old Hagia Sofia abodes a history as multifarious as the city it rests in. Commencing its existence as the Hagia Sofia Church (Church of Holy Wisdom), it was converted into a mosque following the Ottoman takeover and today it is a museum to expose the extraordinarily beautiful artworks. Grand architectural gift to the capital of Turkey, owing to Sultan Ahmet, was this stunning mosque, known today as the Blue Mosque. Built in the early 16 century, the mosque induced a furor all over the Muslim world when it was completed for the six minarets it had, same in number as that of Grand Mosque in Makkah. Eventually, a seventh minaret was presented to Makkah as a gift to stop the conflict. The mosque catches its epithet from the hundreds of thousands of Iznic tiles that adorn its interior. The whole dimensional impression and interior color hues mark this mosque as one of the exceptional realizations of Ottoman architecture. The aged Hippodrome was set up in AD 203 by Septimus Severus and finalized in AD 330 by Constantine the Great. This used to be the epicenter of Byzantine public life and the arena of chariot races and grand games but it also witnessed sectarian clashes. In its prime, obelisks and figurines graced its charm, some of which can still be seen today. Freshly remodeled in its landscape, it is one of the Istanbul’s most prevalent meeting places and walkways. This enormous enclosed market that takes up an entire city quarter is the world’s first shopping mall. Bounded by thick walls, amid Beyazit Mosque and the Nure Osmaniye Mosque, the Grand Bazaar enchants its visitors with its vibrant aura and amusing atmosphere. Enter through one of its 11 gates into a maze of about 4000 shops and stalls that sell antiques, jewelry, gold, leather-ware and souvenir. Topkapi Palace, once the home of Ottoman Sultans, exhibits royal treasury, sanctified Islamic vestiges, Chinese porcelain, weaponry, calligraphy section etc. Your guide will give you free time to roam around the palace and explore the spectacles. The Rustem Pasha mosque, irrespective of its small size, is one of the most admirable Ottoman mosques in the capital of Turkey. The expressive colors fused with floral and geometrical patterns on the Iznic tiles will amaze you just as you enter the mosque. It is a characteristic illustration of Islamic architecture that stands amid the lines of shops adjoining the Spice Bazaar. Final availability subject to our confirmation by email. Including Europe on one end and Asia on the other, Istanbul not only treasures in it the valuables that date back to the historic times but also abodes the wonders that are a reflection of modern day creativity and luxurious affluence. During the voyage of exploration, one may encounter historic testaments and relics having an account that traces back to thousands of years. Whether you roam around to discover every nook of Istanbul or traverse through the neighboring districts, you will grasp hold of an array of natural and ancient spectacles spread throughout. This impeccable city, connecting two continents, where one could come upon people from diverse cultures integrating in a harmonic tone, will stimulate utterly surprising feelings in you.